Author, researcher and long-time river rat (his words) Pat Tierney has spent more than 38 years of his life exploring, rafting and helping to protect the Yampa River in Northwestern Colorado. 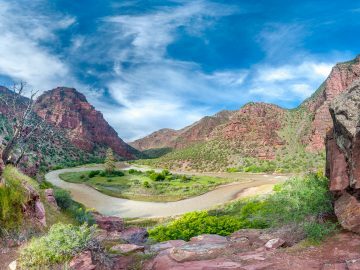 His love of the river started just out of college when he landed a job as a kayak-based ranger in Dinosaur National Monument. 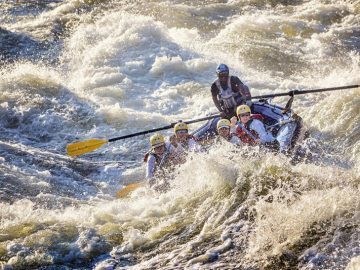 Even though he had never run the Yampa before, for him, it was a dream come true. Now, after decades of running a commercial rafting company and a couple hundred Yampa trips later, he’s teamed up with renowned nature photographer John Fielder and published the ultimate Yampa River book, Colorado’s Yampa River: Free Flowing and Wild From the Flat Tops to the Green. And with the water crisis heating up in the West, the timing couldn’t be better. 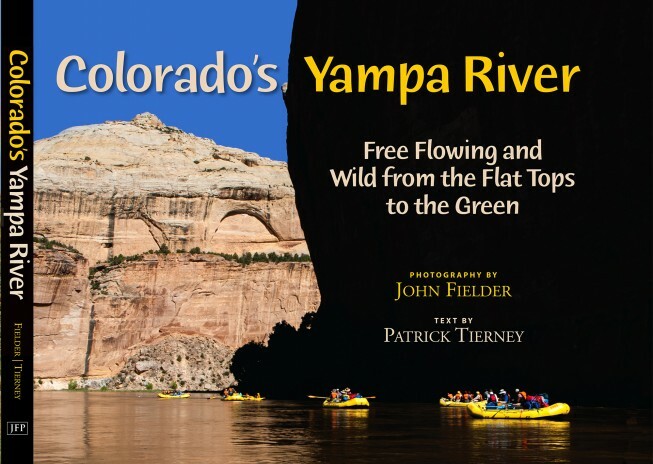 Pat tells us about his book below, the threats currently facing the Yampa River, and why this free-flowing river needs to be protected for the long-term. What makes the Yampa so special? It’s a combination of things. You’ve got a beautiful, 2,000-foot deep wilderness canyon with scenic side canyon hikes. You’ve got a well-managed river by the National Park Service that’s not over-crowded, beautiful campsites, fun rapids. Then you’ve got Warm Springs rapid, which is always very respectable. There are 1,000-year-old Indian rock art gracing the canyon walls, peregrine falcons, bighorn sheep and many other wildlife. 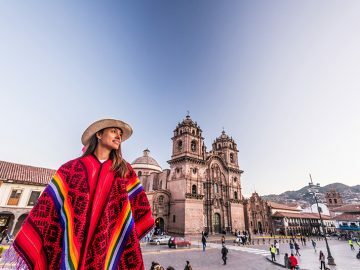 It’s all of those things that make it an extremely special trip. 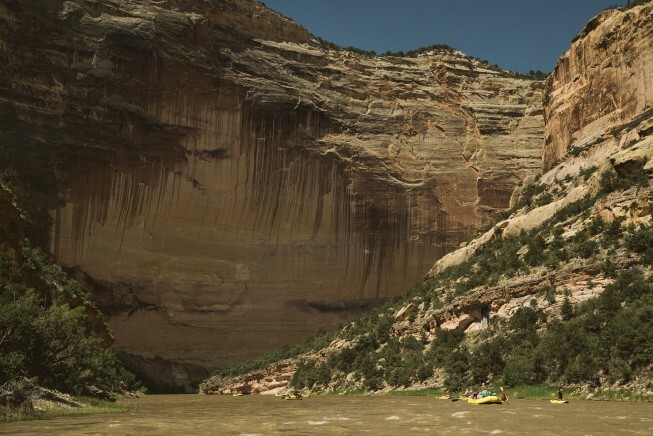 What inspired your Colorado’s Yampa River book project? 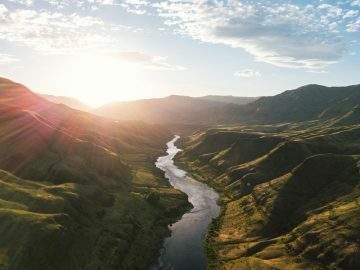 I always had a dream of writing a book about the Yampa, because of all the rivers I’ve rafted in the Western United States and Alaska I thought it was such a special place. 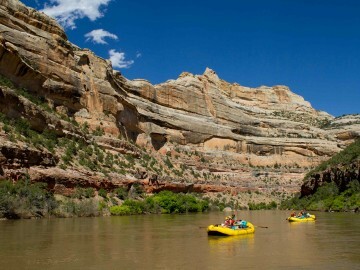 Boaters in Utah and Colorado know it, but the average man or woman, I don’t believe, know what the Yampa is. Our goal for the Yampa book is to simply protect the river. 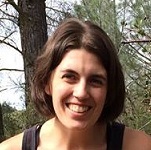 Why did you feel now was the right time to publish this book? There are proposed pump back projects that South (Denver) Metro Water Supply Authority and the Northern Colorado Water Conservancy District want to have, which would significantly hurt the river in terms of naturalness, and significantly impact the Green River, Deso [Desolation Canyon], Cataract and everything down below. They want to steal the water and trade the green riparian areas in Dinosaur so they can make green lawns in Denver. So now is the time with these proposals out there—the Yampa Pump Back and the South Metro Pump proposals—now is a good time to have the book out. Can you expand on the threats facing the Yampa right now? There’s a July 2015 Denver Post article that quotes the Northern Colorado Water Conservancy District Director as saying this project must be considered. And in the 2015 Master Plan for the South Metro Water Supply Authority, the Pump Back is in their plan. So I think it needs to be discussed right now and be put in a coffin. And we need to get in place, I talk about this in the book, additional protections that could and should be implemented on the Yampa to make it more of a victory and a long-term wild river. Because as climate change happens, the whole upper and lower Colorado River Basin is going to be stretched more and more. So there’s going to be even more pressure on the Yampa. We’ve got to hopefully put in some additional protections—like Wild & Scenic status—to make the Yampa sustainable for the long-term. Playing devil’s advocate here, who cares? Why should we fight to keep the Yampa wild? The Pump Back Project is a destructive boondoggle that is not needed. And the Yampa today, if we just leave it alone, provides tremendous benefits to the region, to nature, to the Southwest. It’s a complicated question. That’s why we wrote the book, to answer that question. You still guide on the Yampa here and there. How have you seen the river change in nearly 40 years? It’s really great to say that it hasn’t changed much. It’s a well-managed river. The number of people who can float the Yampa has been nearly the same since 1971. The Park Service does a great job managing the resources and the river use in Dinosaur. They’re managing for a quality experience versus a theme park experience and because of that, 95 percent of the river corridor is exactly as it was years and years ago. We’ve urged the Park Service, for example, to take out the picnic tables and pit toilets that were in there in the 70s and early 80s. So now when you come into a camp you don’t see anything but a beach. The river is still wild. It roars to life every spring and early summer with high peak flows. Peregrine falcons, river otters, bald eagles and bighorn sheep have all been restored to the river corridor. In some ways, it’s really improved. You can not say that about most rivers. We’re trying to keep it from changing.